Acknowledged author Michael Osborn wrote Public Speaking comprising 448 pages back in 2017. Textbook and etextbook are published under ISBN 0134380924 and 9780134380926. 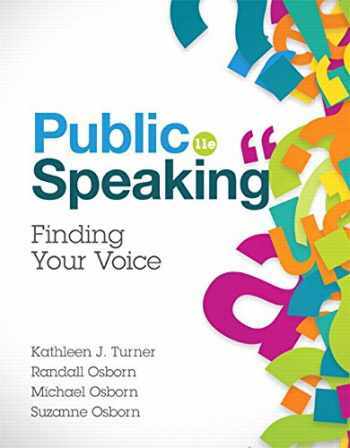 Since then Public Speaking textbook received total rating of 3.5 stars and was available to sell back to BooksRun online for the top buyback price of $78.08 or rent at the marketplace. For courses in Public Speaking Helps students become better speakers in their classrooms, workplaces, and communities Public Speaking: Finding Your Voice helps students develop into effective speakers while emphasizing the ethical significance of public speaking and its importance in our increasingly diverse society. Authors Kathleen J. Turner, Randall Osborn, Michael Osborn, and Suzanne Osborn guide students to become better, more thoughtful consumers as well as producers of messages — all the more important in an age when we are daily bombarded with “fake news” and other forms of deceptive communication. The 11th Edition includes fully updated examples as well as revised learning outcomes that help keep students on track in the course. Public Speaking: Finding Your Voice, 11th Edition is also available via Revel™, an interactive learning environment that enables students to read, practice, and study in one continuous experience.